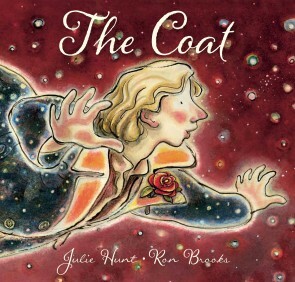 The Coat stood in a paddock at the end of a row of strawberries. It was buttoned up tight and stuffed full of straw and it was angry. ‘What a waste of me!’ it yelled. Then along came a man. ‘I could do with a coat like that,’ the man said. Together, swooping and swinging, they travelled to the Cafe Delitzia, and had the night of their lives. Illustrated by Australia’s leading picture book artist, this is a surprising and delicious story that will lift you off your feet and whirl you away. A coat in a strawberry patch flies off with a down-at-heel man, and together they have the night of their lives.